Selected Villas for rent near Snookah Diving (Koh Samui) - Contact us now! Keen to explore the underwater life in Chaweng? If you are, make sure to try out snookah diving! ‘But what’s that? Do you mean scuba diving?’ You wonder curiously. 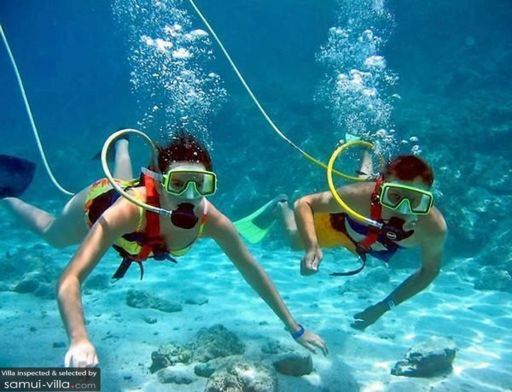 Snookah diving is a reconfigured form of scuba diving, to allow for diving in shallow waters so that anyone can participate in this activity. You may join shorter trips lasting a duration of two hours, to explore the nearby virgin reefs and islands located close to Koh Samui. Longer half-day trips are also conducted, bringing divers to places such as Koh Tan and Koh Mutsum.